A Lonely Shadow | It isn't time that's passing by..it's you and i.. I wrote this back in August of 2003 and strangely quite a few people liked it back then. I just found it today hiding beneath my stack of sheets. So I thought I would put it up here. 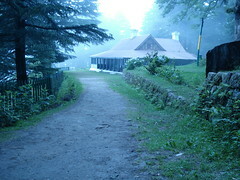 The photo is of Kalatop Rest House at Khajjiar, Himachal. Oh to hear the summer trees softly whispering away. The haunting presence of a lady enticing you for her embrace reminds me of the lines – “the wailing woman waiting for her demon lover” perhaps coming somewhere in the extemporary poem of S.T. Coleridge, Kubla Khan! So, don’t be caught by the nymphs in the cold nights! just reminds of the ghost stories penned by Ruskin Bond. Seems you encountered the loving breath of the Divine mother encouraging you on your journey. Perhaps she once lived there in one of her incarnations and her presence still remains as she awaits the return of her Beloved. Great Poetry at very young age! !